Professionals in thievery and business behave in a very similar manner. Only a tiny percentage of thieves are recognized and view themselves as being professional: full time, rational and consistent planning. The most prestigious of theft rackets is The Grift or Con games. The Grift requires cooperation among specialists. For any group to function productively, certain rules need to be known and obeyed. This discipline is generally higher than in straight business because of the extralegal nature of some of their work. In addition to their specialized skills, a professional thief must have a more general capability called larceny sense. Larceny Sense: This term is applied to the thief just as the term “business sense” is applied to the business man. It is an ability to deal with unusual situations in the best possible manner and is acquired in the course of experience. Every thief with good larceny sense will try to figure out every eventuality in taking off a touch. Some thieves are considered to have no larceny sense, while others have plenty of it. Franchise marketing, for some systems, has evolved into a specialized, highly secretive applied fraud. Each trademark system has a number of 3 or 4 professionals working to sell and resell franchises that are designed to fail for the investor. There is no boss per se within the group. Because the work is underground, there is little documentation available. If there is a boss in the traditional sense, it would be the banker in head office who are within the small business lending division. These Franchise Bankers (one bank per franchise system) work very closely with the franchisor for their direct lending needs as well as setting up extremely lucrative service contracts for their franchisees (current accounts, merchant accounts, etc.). In 2000, I interviewed Dan Farmer of the Royal Bank of Canada. He stated that franchise lending was “the most lucrative form of commercial lending there is”. lender (specific bank official, specific bank branch: a high-risk, 24-hour turnaround on government guaranteed loans). In their function as lenders, bank officers owe their borrowers a legal duty to perform lender’s due diligence. They are prohibited by law from creating debt instruments that they knew or should be reasonably be expected to know would be unsustainable or result in the borrower’s financial ruin. In Canada, the relevant statutes are the Bank Act and the Canada Small Business Financing Act and Regulations. Banks and bank officers are not being held accountable because these arrangements, although highly exploitable, provide substantial profits to the franchise bar, franchisors, etc. Canada has a well-known reputation for harbouring white-collar criminals. This, however, is very, very fertile litigation soil for outside law firms that can know what questions to ask. That I am a 1/3 partner in only one active lawsuit, speaks not to the rarity of the fraud but to my restraint and patience for the cleanup to happen. In 2005, we had identified over 12 potential lawsuits involving just one franchise system, bank pairing. How does a professional thief retire from a mob? money to be used in case of arrest, discharge or retirement. It is a sum of money held in trust for expenses in case any member of the mob gets pinched, busted, exposed. The mob itself owns it so it would be split evenly if the mob dissolved. Who actually holds the cash depends on the racket and few thieves would gamble or lose the money as that would be a very serious breech of the professional thieves’ code of conduct. Conditions upon Retirement: The retiree can only return to the life if the mob agrees. This monograph by a professional thief—with the aid of Edwin H. Sutherland’s expert comments and analyses—is a revealing sociological document that goes far to explain the genesis, development, and patterns of criminal behavior. “Chic Conwell,” as the author was known in the underworld, gives a candid and forthright account of the highly organized society in which the professional thief lives. He tells how he learned to steal, survive, succeed, and ultimately to pay his debt to society and prepare himself for full and useful citizenship. 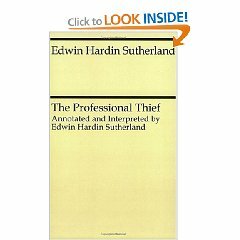 The Professional Thief presents in amazing detail the hard, cold facts about the private lives and professional habits of pickpockets, shoplifters, and conmen, and brings into focus the essential psychological and sociological situations that beget and support professional crime. I believe a dignified exit to a vocation [as with life] is a noble goal. I would hope to offer that to a colleague and would hope it to be reciprocated. If A/R collection is the only obstacle, it can and should be handled in a professional, gentlemanly and timely manner. You got a leak, you call plumber, He performs, & You pay a fair charge. You get caught: You pay your fine and move on. Best of luck. Go easy or go hard: it’s entirely Your choice, Your funeral. Continuing a deceitful, belittling and economic privation strategy will result in some otherwise entirely avoidable reputational consequences which, once started, cannot be controlled. I wish everyone as Happy a New Year as possible.